During the next few weeks, I will be cooking from and reviewing some of the year’s best books for gift-giving. They mostly are personal selections from chefs whose work I know well plus a few I don’t know at all. I always am enamored of cookbooks from Phaidon, Artisan, Chronicle and Ten Speed Press, but am impressed this year with the quality and variety of cookbooks published by smaller presses; Monkfish and Interlink among them. In addition to their more obvious purpose, cookbooks are great sources of inspiration and bedtime reading. They are often the gifts we don’t give ourselves but, like a good box of chocolates, we’re thrilled to be the recipient. Happy Holidays! 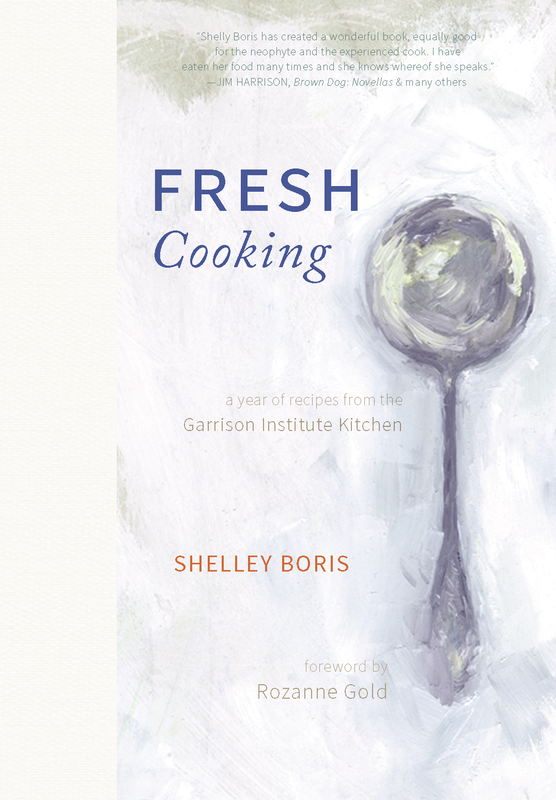 The subtitle of this compelling book – a year of recipes from the Garrison Institute Kitchen — tells the tale of a talented chef cooking for hundreds of guests in a beautiful monastery on the Hudson. Garrison Institute, created by inspired thinkers, Jonathan and Diana Rose, has served as a beacon for the world’s great spiritual and educational leaders, including His Holiness the Dalai Lama who has dined there on several occasions. Shelley Boris, the chef at Garrison for more than ten years, has wowed me with her intelligent, countrified sensibility since my first visit a decade ago. There have been many visits since and I was honored when asked to write the foreword to her book. Shelley’s compassionate approach to cooking, deeply rooted in the seasons, is always mindful of the communal table – which is literally how one eats in the Institute’s massive sun-lit dining room. From her large gracious kitchen, Shelley delights in the daily planning of her menus, each a short story revealing something immediate in nature. January brings her comforting Onion Soup with Sprout Creek Cheese and Sour Rye Toast, baked white beans, and crimson quince blanketed in phyllo. May is more spontaneous and carefree – braised lamb and rhubarb chutney, rice with sorrel, garlic chives and mustard greens, and strawberry shortcakes. The book’s recipes range from simple creations – pan-quiche with cauliflower and cheddar, savory chickpea cakes with tahini sauce; winter root vegetable salad with sherry-hazelnut dressing – to dishes that require slow seduction to coalesce their flavors — Thai-style eggplant curry with coconut milk, lemongrass and shiitakes, and braised spicy lamb with apples. Other standouts are Shelley’s breakfast scones – the best I’ve ever had — and her dizzying array of addictive vinaigrettes — carrot-lime, ginger-grapefruit, pear-beet, creamy shallot. Personal and idealistic, she calls her repertoire friendly-to-meat eaters: rich in vegetables, yet not strictly vegetarian. “We flip the typical equation,” she purports. “Rather than cutting back on meat, these recipes help you think about where you want to add meat and fish to your diet.” Nice. 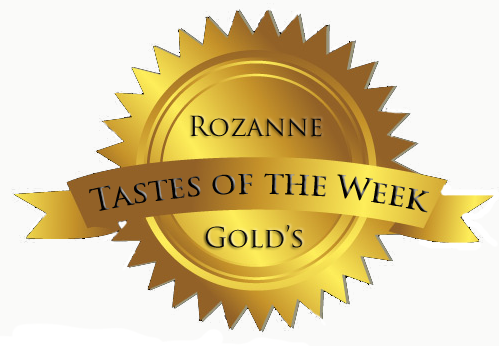 Family-style and deeply practical, she rids her recipes of extra steps and superfluous ingredients in order to focus on the essence of each dish. Working within a limited budget became a driving force of creativity and resulted in recipes that are inexpensive to produce. This is exactly what a home cook desires and why she decided to write the book in the first place. Perhaps it will sit nestled next to like-minded tomes such as the Chez Panisse Menu Cookbook, Perla Meyers’ The Seasonal Kitchen, and Moosewood cookbooks – older iconic examples serving as game-changers in the way that people think about, and connect to food and cooking in a larger context – where taste and ethics need not be at odds. When authors such as Arronte compile cookbooks about a national cuisine as vast as Mexico’s, the goal is to produce a well-rounded exploration that evokes and authenticates, the inherent spirit of a nation’s cultural foodways. Margarita Carrillo Arronte, Mexico’s global ambassador for all things culinary, has certainly accomplished this along with the remarkable design team at Phaidon Press, headquartered in London with offices in New York City. This massive tome, feeling like a work of art or runway fashion statement, is undoubtedly among the most beautiful books this year. Replete with 650 recipes and 200 photos, the book draws inspiration from various sources, some from which have been altered to the author’s own taste by adjusting ingredients, measurements or methods. Ms. Arronte wants the dishes of her homeland, and its many regions, to be cooked and experienced by audiences who have not yet plunged into the depths of mole (mole-lay) making – including an intriguing beet mole – to the more familiar tamales, enchiladas, and fresh fish Veracruz-style, to the less familiar rabbit with prunes and chili, ox tongue in pecan sauce, and birria, a fragrant lamb soup from Jalisco. Much admired in Mexico for the last 35 years, Ms. Arronte has owned restaurants and food companies, hosted television food shows, researched and taught all over the world. She is a formally trained teacher, turned chef and activist, involved in the decade-long effort to have traditional Mexican cuisine recognized with a United Nations Educational, Scientific and Cultural Organization (UNESCO) Intangible Cultural Heritage of Humanity designation. Although I wish that head notes were included with each recipe, I understand how daunting a task this would be. The recipes, both classic and traditional, with a swath of contemporary recipes from restaurant chefs, feel mostly accessible – but some ingredients – specific chilies, epazote, avocado leaves — may be hard to find. This does not diminish the book’s pleasures. Part of Ms. Arronte’s research is to delve into other references and oral traditions for inspiration and to re-create recipes that are considered seminal in the development of the cuisine. This is the true nature of recipe transmission and the way that dishes evolve and national cuisines are created. 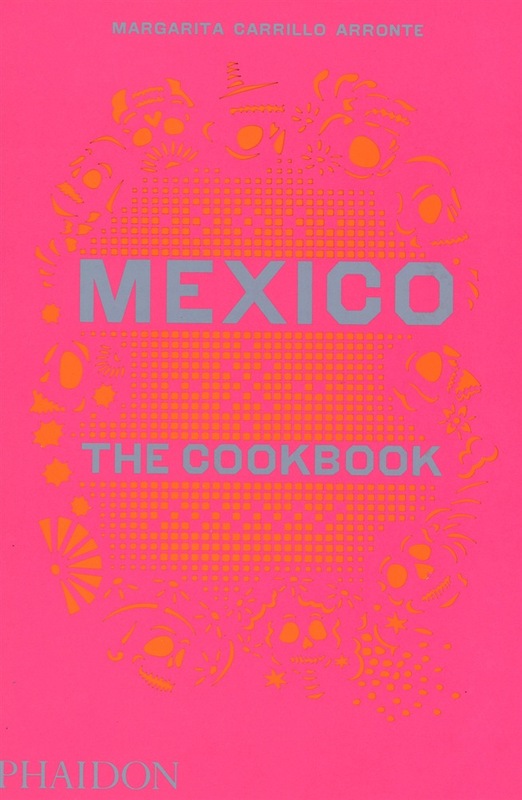 There is an extensive bibliography that includes the important work of Mexican culinary guru, Diana Kennedy. It is a great gift to go hand in hand with a cup of Mexican hot chocolate, in bed if not in your kitchen. Okay, this is my holiday gift to you. From the 325 recipes included in Radically Simple: Brilliant Flavors with Breathtaking Ease, this succulent pork dish has become the most famous. I know people who now make it once a week. It would be great on your holiday table whether you are creating a buffet (in which I would slice the pork very thin for easy serving) or whether you are plating the food in the kitchen. It sports the bright red and green colors of the holiday with a celebratory air. The dish is a riff on an Italian classic dish in which pork is cooked in milk flavored with juniper. My version is much simpler but equally divine. You can augment the sauce by adding some dry white wine in addition to the gin. It’s lovely with a platter of sautéed broccoli rabe and a mound of buttery cauliflower & potato puree. I prepare the dish in a paella pan but you can use a very large ovenproof skillet. 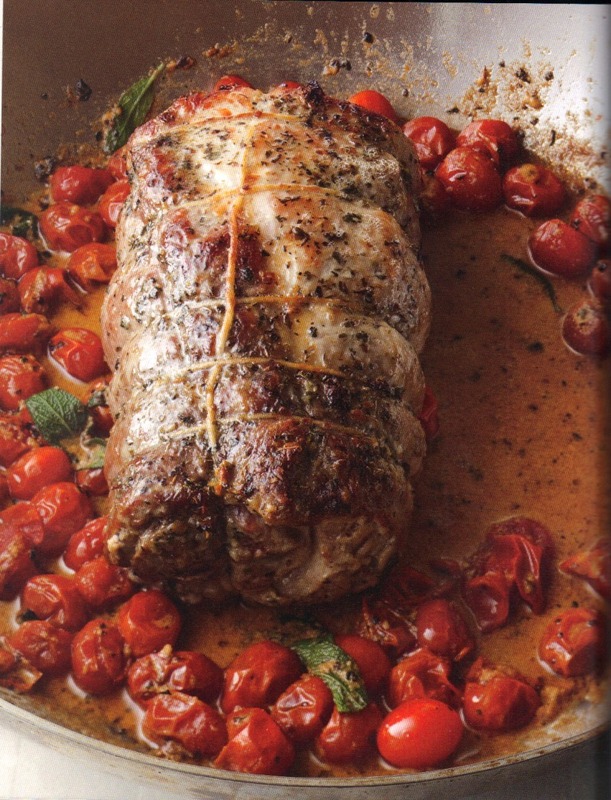 It’s so easy to prepare that you can make two pork loins at the same time and serve 12! Happy Holidays! This is one of the simplest, most festive dishes I know. It can be prepped and cooked in less than one hour yet looks like you’ve been fussing all day. 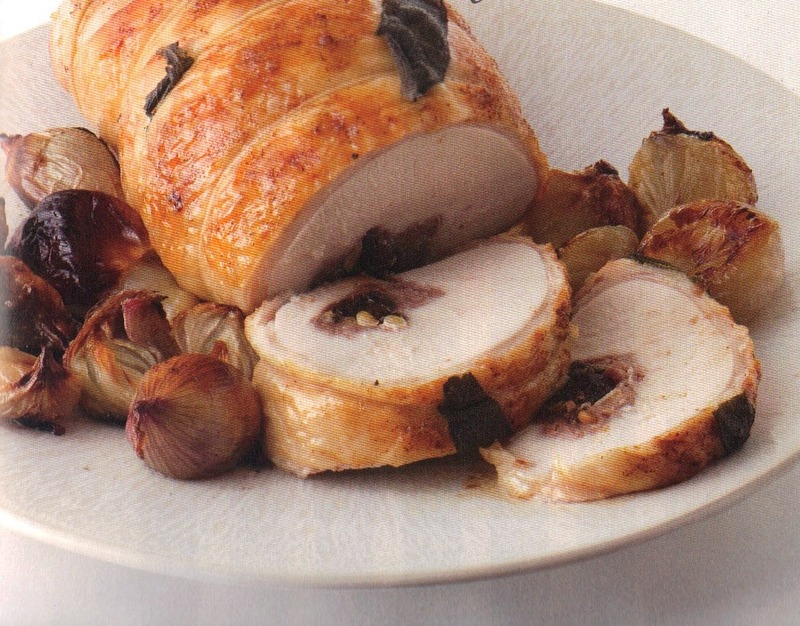 This turkey roast is nothing more than a boned breast half, flattened slightly, so that it can be filled, rolled and tied. Prosciutto, fresh sage, and prunes perfume the dish and feel like Christmas to me. Be sure to serve it with a bowl of my (now famous) sweet potato puree whirled with fresh ginger and orange. A grand cru Beaujolais would be just the thing to drink. This is fat-free but tastes very rich all the same. For a bit more intrigue, spice it up with a pinch of ground cumin, ground coriander, ground cardamom — or all three. 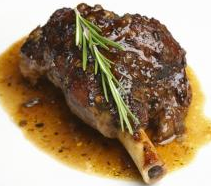 Lamb shanks are a fabulous way to feed your guests during the holidays. 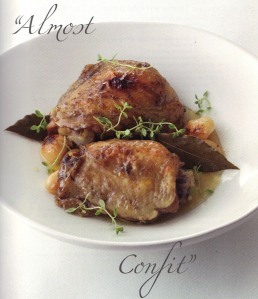 You can prepare the recipe one to two days in advance allowing the flavors, and textures, to deepen. Just yesterday, a colleague told me she made this recipe, tossed the lusty leftover sauce with basmati rice, and ate it in bed while reading the rest of the cookbook. She then decided to make her entire New Year’s Day menu from Radically Simple. (Last year she used the wonderful Jerusalem cookbook.) I like to serve this with creamy polenta (and open a bottle of Barolo) or with a rich potato gratin layered with Gruyere (and raid our cellar for an old Côtes du Rhône.) For the Christmas table I poach tiny kumquats in simple syrup until they collapse: They make a festive accompaniment and taste amazing with the lamb. This is nice and easy for a complicated-sounding dish. I simplify the process by quickly searing the seasoned shanks under the broiler. The lusty flavors come from dried porcini mushrooms and herbes de Provence. At the last minute, I dust the hot dish with freshly grated orange zest — the aroma is wonderful. 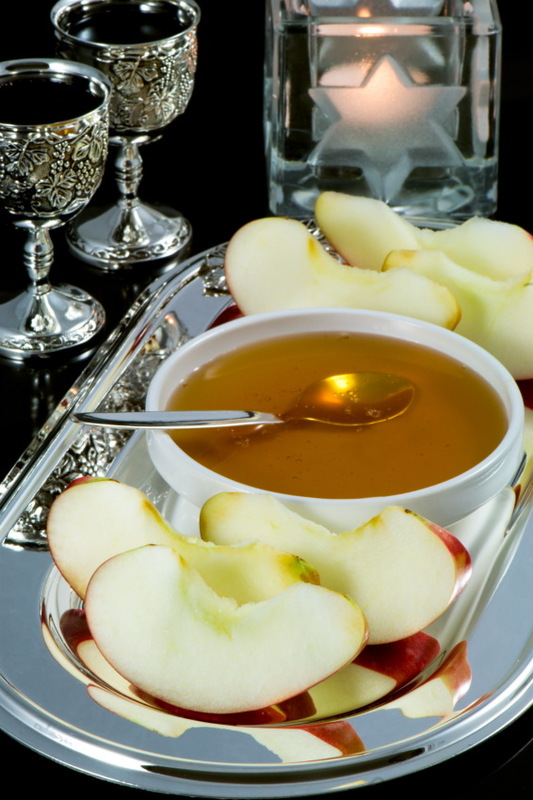 Happy New Year and l’shana tova to all those who celebrate. If still deciding what to make, why not try my “Tamarind Brisket” and my “Almost Confit Chicken.” May it be a sweet year for everyone. Ask your butcher for the “first cut” and make sure to leave some of the fat on the brisket for best results. In a very large enamel casserole with cover, put 2 tablespoon oil. Season meat with salt and pepper and brown over high heat, about 4 minutes per side. Remove meat. Cut onions in half through stem end. Put cut side down on board and slice very thin. Add 2 tbsp. oil to pot and add onions. Cook over medium-high heat for 10 minutes, stirring frequently, until softened and golden brown. Return beef to pot and put on top of onions. Put tamarind in a bowl. Whisk in orange juice, tomato puree, and beef broth. Push garlic through a garlic press and whisk into mixture. Add 1/2 teaspoon salt and freshly ground black pepper. Pour mixture over brisket. Bake 1 hour, covered. Turn brisket over, cover and bake 1 hour longer. Add potatoes and shallots. Bake 1 hour longer. *Available in Indian food stores and Middle Eastern markets. It comes in small plastic jars and is called concentrate of tamarind. And check out the food maven’s website for a good honey cake recipe. What better way to welcome the tastes of a new year than at a Chinese banquet. Not in a restaurant, mind you, but in the comfort of someone’s home. And so, just a few days ago, our friends and neighbors, Simon Liu and Susan Goldberg-Liu, invited us to a “dumpling fest” at their gorgeously restored brownstone. 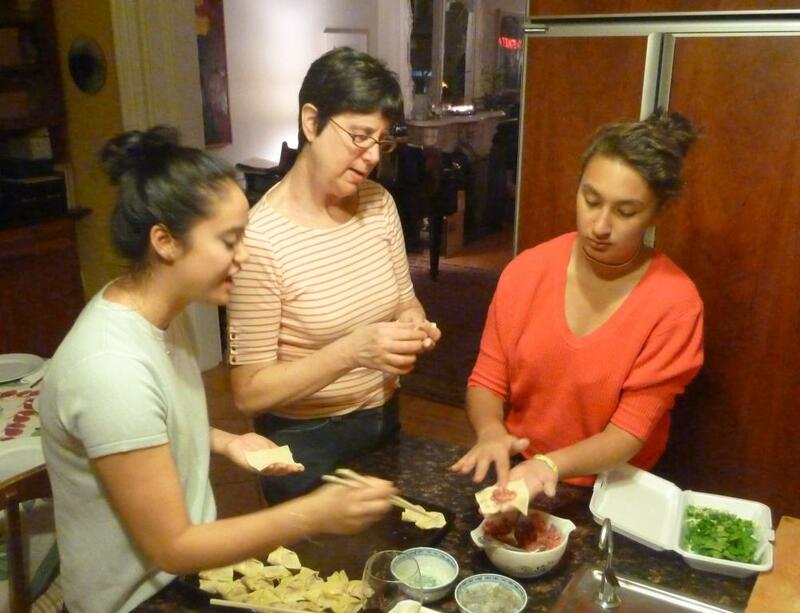 Along with their son Max (just home from Paris) and daughter Emma, our daughter Shayna learned to fill and fold her first dumplings (see photo), while Simon tended to his homemade chicken broth in which they all were poached. We had dumplings of shrimp and sausage, some of “just sausage” as Shayna’s still shy of seafood, along with some naked fishballs. They reminded me of Italian gnudi, which are ravioli without the ravioli skin. Rounding out the meal were roast duck, pork and cuttlefish purchased in Brooklyn’s vibrant Chinatown, where Simon has his art-and-restoration studio. It was all washed down with a rioja from Spain and a sauvignon blanc from Argentina. Everyone said no thank you to the barrage of chocolates and gingerbread men that followed, and then, of course, we ate them all. I often make an extra turkey on Thanksgiving because, in my opinion, it’s not a party without copious leftovers for guests to take home. With that in mind, I encouraged my husband to roast an entire leg of pig for New Year’s Eve even though were only eight for dinner and even though he pointed out that, after allowing for the bones, we’d have over two pounds of pig per person. Dutifully, he cut deep slits into the meat and stuffed them with a chop-up of fresh rosemary, sage, thyme, hot peppers, sea salt and an immeasurable quantity of garlic — these being the seasonings for a classic Italian porchetta. The resulting roast looked like a bronzed sculpture sitting on our kitchen counter, and after he’d carved enough for double portions it still resembled a Henry Moore. No matter, I simply invited another shift of friends for lunch on New Year’s Day and after slicing off food for a dozen guests, there it was, slightly diminished, but still hulking. Eternity has been described as “two people and a ham” (perhaps by Dorothy Parker). After a couple of meals of leftover leg, a roast pork ragu with penne rigate and several sandwiches of garlicky pork, sriracha, sliced tomatoes, arugula & pickled red onions, we just tonight saw the last of it — except for stock made from the bones, which reside in our freezer waiting for a day in some uncertain future when our appetite is at last restored. A vegetarian gift to all for the New Year. In Italy, lentils are good luck for the new year and so this is my wish for all. Made by the maestro himself, we enjoyed it tremendously on New Year’s day. Click here for the recipe. We washed at least this number by hand. A variety of shapes and sizes, for champagne, wines, moscato passito di Pantelleria, and Liquore Centerba, a digestif made with 100 herbs — which was very helpful at the end of such a week. 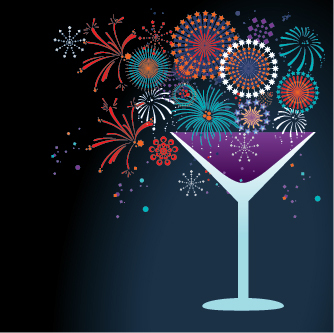 Here’s to a delicious 2012. There are bartenders who make a living mixing cocktails, and baristas whose wages are earned behind espresso machines. There are high-concept tea masters, sommeliers, and soda jerks, too. At home we are never expected to be any of these, but when guests arrive for your holiday parties some simple instruction might be helpful. After all, there’s a week’s worth of celebrating still to be done. I tend to restrict drinks at my dinner parties to champagne and wine and perhaps one great cocktail. I suggest you try all the ideas here, or create your own, but choose only one as your “house special.” “What you don’t need,” says wine writer Anthony Dias Blue, “is people sidling up to your bar expecting a Singapore Sling or a mai tai,” or both! I know a thing or two about drinks. At age 16, I was a bartender, illegally, at the Olde London Fishery in Queens, New York. I was tall for my age and looked the part. Next, I had the ultimate pleasure of helping create two of New York’s most spectacular bars – the Rainbow Promenade at the Rainbow Room atop Rockefeller Center, where Sleepless in Seattle was shot, and the Greatest Bar on Earth on the 106th floor of the now legendary Windows on the World. A great drink is always remembered. When making cocktails, apply my 1-2-3 principle: 1-The best drinks are made from the best raw materials — including freshly made ice cubes. 2-Temperature is critical. Serve mixed drinks in chilled or frozen glasses and white wine properly cooled, and keep a pitcher-full of a pre-mixed cocktail in the fridge so it doesn’t inflict global warming upon your ice cubes. 3- Use the appropriate glassware. And you’ll notice that unlike most cocktail recipes, which measure the alcohol in ounces or shots, I use tablespoon measures for simplicity’s sake. Great drinks are not about lots of ingredients: Rather it is about the discreet balance of flavors – with acidity and sweetness being key factors. While it’s always festive to serve name-brand bubbly to put your best foot forward, it can be very expensive and not always necessary. In fact, just this week I invented a beautiful cocktail for Lenox China called “Bittersweet” – using Prosecco (or cava or any other inexpensive brut sparkling wine) – to which I add Campari, Chambord, and a bit of freshly-squeezed orange juice. It is a perfect match with my Smoked Salmon Quesadillas strewn with bits of grated lemon zest and snippets of fresh basil. Many guests are opting for sparkling water and nonalcoholic “mocktails” these days, so you’ll be a great host if you offer those. Even a jug of freshly-squeezed blood orange juice, which I call “Nature’s Kool-Aid,” shows that you have considered the needs of all your friends. A note about wine: The party line on party wine is to go “big.” Offer wine or bubbly from magnums – it’s always impressive and there are great products from around the world that provide terrific value. We have found a “house red” from Argentina that is a blend of malbec and bonarda (an ancient grape of northern Italy.) It is $10.99 a magnum! Reserve your premium wines for smaller dinner parties and start celebrating now. You may substitute Cassis (blackcurrant liqueur) for the Chambord. This is a sophisticated highball and one of my seasonal favorites. Very elegant. especially in an extra- large martini glass. Excellent choice for the entire Christmas season. Make these by the pitcher so that you don’t need to be shaking and stirring when your guests arrive. Stir pear nectar and apple juice together in a pitcher. Halve 3 limes and squeeze 6 tablespoons juice into the pitcher. Add the honey and stir until dissolved; stir in the vodka. Grate ginger on the large holes of a box grater. Place the grated ginger in a paper towel and squeeze to extract 1 tablespoon juice; add to pitcher. Stir, cover, and chill well. A very special holiday libation – here’s an after-dinner drink invented by me to honor the artist. A “Cocteau” instead of a cocktail! Pour all ingredients into a mixing glass with ice cubes. Stir vigorously. Strain into chilled cocktail glass. Float more cassis on top, letting it filter down into the drink. The 1-2-3 Collection Now Available on the iBookstore!